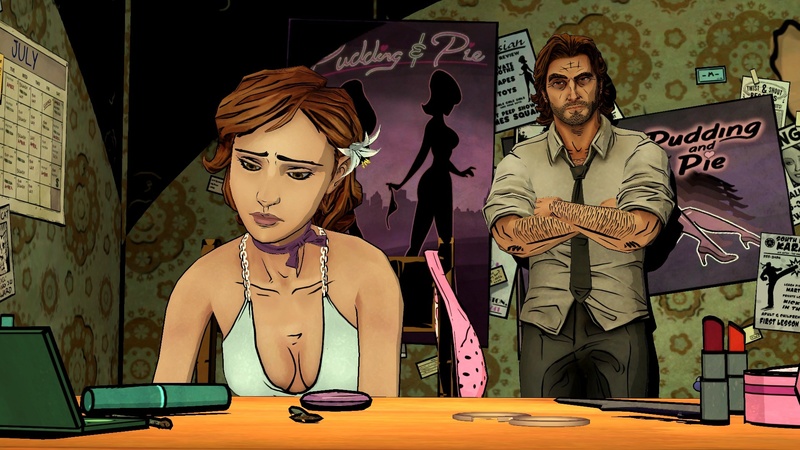 Bigby continues investigating for the ‘now-serial killer’ walking the streets of Fabletown. After episode one’s introduction to the cast of characters, their stories and the world they live in, the gorgeous film-noir fantasy thriller continues with Smoke and Mirrors and the story gets even more complicated and twisted. The story chugs along with interesting little developments you know is just going to come back to bite you in the backside later on and the whole murder mystery gets more complicated, the relationships become more fleshed out and you’re caught right in the middle having to choose between the dark, the light or the grey. By this point in the story, I am already invested in this world, intrigued by the murder mystery and keen on seeing what other fairy tale or mythological creatures get the adult treatment (The little mermaid is a prostitute? Awesome! Great for her!) so I’m eager to keep heading on through the plot. I won’t spoil the specifics about the plot but let’s just say that things are about to get a little weirder, a little darker and a little more complicated and let’s leave it at that. Apart from that, you might know the rest and the obvious. The artwork is gorgeous, the voice acting hits all the right notes and the moody musical score is neat and atmospheric. Telltale Games delivers another satisfying and exciting episode – if you haven’t checked this out already, be sure to make your way to gaming console of choice and get right on it.